Frugal Tractor Mom: Hamp's New Tricks!! Now that my little one, Hamp, is mobile, he is learning all types of new tricks. It seems that everyday he comes up with a new trick. I thought I would share some of these new tricks. Let's start with what happened after dinner the other day. 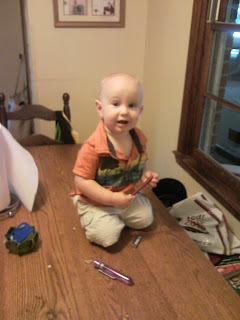 I'm cleaning the kitchen when I look around and find Hamp on the dinning room table. He ha gotten up on the bench and then up on the table. This was the first time! Next trick goes along with the dinning room table. He actually learned this one first...climbing up in the rocking chairs or any chair. The other day we were all outside. I was working in my flower garden and Hamp was playing on his little black truck. I turned around and Hamp was not in his truck. 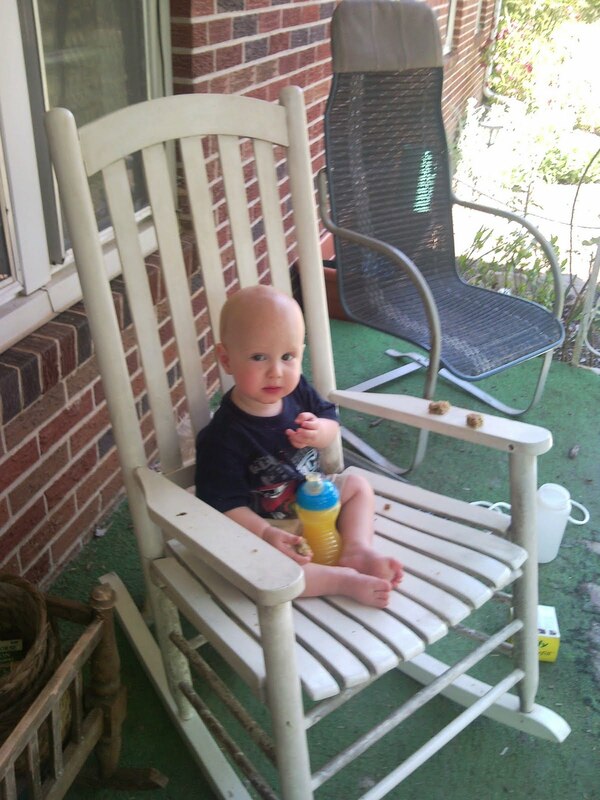 When I started looking, found him up on the front porch sitting in the rocking chair eating banana bread! Don't he look like a little man! Now his last trick! As I've said before, our house is over 50 years old and was my grandparents house before we moved in a few years ago. 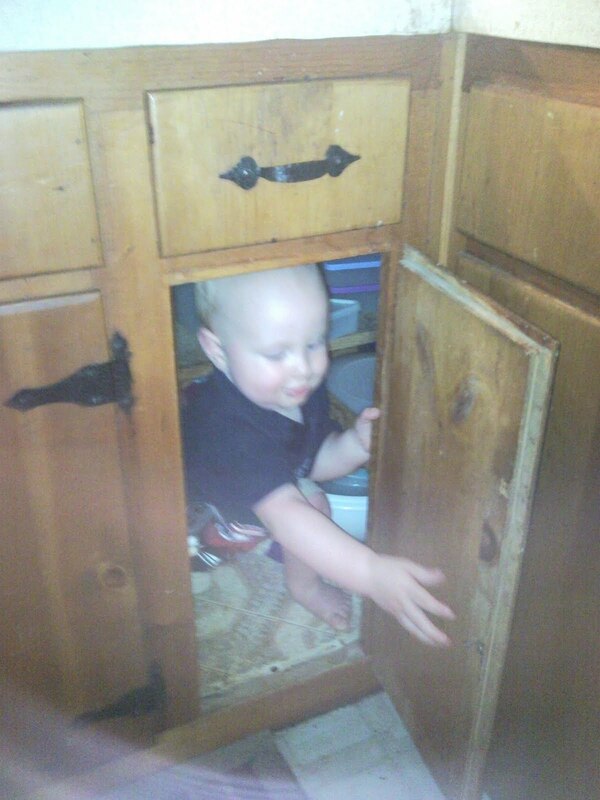 I let Hamp get into the kitchen cabinets that don't have anything breakable or dangerous in them. There is a half door kitchen cabinet that opens to a huge inter cabinet storage space that has all my tupperware in it. While I was cooking the other day, Hamp was playing in the under my feet as usual. I soon realized that he wasn't under my feet! But where did he go? I could hear him, but could see him. I found him in the cabinet! He has learned to not only open the door, but how to close it with him in the cabinet! Every time I have been in the kitchen since that day I find him getting in this cabinet. It's better than any type of fort you could buy! Keep coming back to check out any new tricks Hamp comes up with! Every day there seems to be a new adventure around here!